It was likely on, and certainly about, this date in 1675 that the Riegersburg Castle keeper’s wife was burned as the “flower witch”. Riegersburg Castle. (cc) image from Tobias Abel. 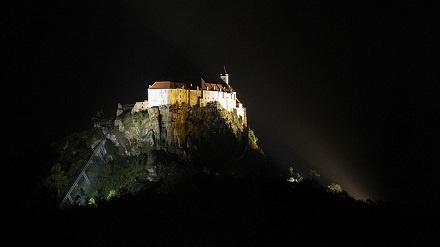 This dramatic keep roosting atop a volcanic crag in southeast Austria today hosts a Witch Museum exhibiting the treatment meted out to those infernal agents. This castle had perhaps become identified as a hostelry of sorceresses by dint of its long management under the Countess Katharina Elisabeth Freifrau von Galler, an iron-willed noblewoman who did not fear to assert prerogatives of power more commonly reserved for male hands — not least of which from the standpoint of posterity’s tourism industry was much of the castle construction one beholds there today. “The bad Liesl” — one of her chiding nicknames — died in 1672 and coincidentally or not a witch hunt swept the surrounding region of Styria from 1673 to 1675. The best-remembered of the accused was the commoner who almost literally personified the Bad Liesl’s fortress: Katharina Paldauf (English Wikipedia entry | German), the wife of Riegersburg Castle’s chief administrator. She was ensnared in the usual way, when accusations from other defendants, who were being tortured for the identities of their witches’ sabbath affiliates, compounded against her. These charges credited Paldauf with the power to conjure foul weather from the depths of hell, as well as murdering children and pitching them into the castle well. In a more grandmotherly vein (Paldauf was 50; older women appear to have been disproportionately vulnerable to witch charges) she’s said to have had the power to pluck blooming flowers even in the dead of winter — the source of her Blumenhexe repute, although this legend, er, stems from folklore rather than anything in the documentary record.